Check opening times for the restaurant to make sure it is open for dinner. La Cova Fumada is only open for dinner on Thursday and Friday. As an alternative you could eat here for lunch and reverse the itinerary, taking the cable car up to Montjuïc Castle. The restaurant is closed on Sunday. Ride the bus to Montjuïc Castle instead of Funicular de Montjuïc. When you think about things to do in Barcelona for kids, you may wonder: is there is a castle in Barcelona? (After all, all children love castles, right?) This itinerary takes you to Montjuïc Castle and its surrounding gardens for an adventure-filled day. Explore the old fortress on top of mount Montjuïc, watch the busy port below (a highlight for any child that loves boats, cranes and trains), and wander through the many beautiful gardens nearby. Then continue your adventure with a fun cable car ride across the Barcelona harbor. End the day at one of the best seafood restaurants in Barcelona. This Barcelona itinerary is sure to please parents and kids alike. Montjuïc Castle may not be one of Barcelona’s top attractions, but it’s worth a visit, especially with kids. The old fort perches high above the city and offers sweeping views over the ocean and Barcelona’s port. Our son loved watching the container ships being loaded and unloaded. Running around the wide castle halls was also great fun. DIRECTIONS You have a few options on how to get to Montjuïc Castle. The best value option is to take the bus. Only Bus 150 goes all the way up the hill to the castle (the others will stop further below and you’ll have to walk). Check directions on Google maps based on your starting location. You can also take the cable car (Funicular de Montjuïc), but I found that to be rather expensive for the short ride. This little playground sits below Montjuïc Castle and is the perfect spot for parents to relax while the kids play. The playground is fenced in, so little ones can’t wander off. There’s a little shop with chairs that sells sodas, beer and snacks. You can easily watch your kids from the provided seating. I enjoyed an ice cream in the shade while my son played with other kids. DIRECTIONS From the entrance of Montjuïc Castle, head downhill along the pedestrian path underneath the cable car. You will first pass the Tobogans de Montjuïc, which are slides built into the hill. The playground will be a little further down next to El Cims Cafe-Bar. TIP Above the playground are a few slides built into the hill (Tobogans de Montjuïc). They are better suited for older kids than for toddlers, so we didn’t try them. But they looked like a lot of fun. Montjuïc is home to a number of beautiful gardens. You could easily spend a few days exploring them all. Our favorite was Jardins de Mossen Costa i Llobera, Barcelona’s cactus garden. This impressive botanical garden is home to cacti from all around the world and it’s completely free. My son loved the funny shapes and bright flowers and my parents welcomed the peace and quiet in such a beautiful setting. DIRECTIONS It’s a 25-min walk from El Cims Cafe-Bar to the cactus garden. Follow Ctra. de Miramar downhill and then turn right onto Ctra. Antiga de Montjuïc. This road will take you to Plaça de l'Armada, another beautiful park with beautiful trees. At the end of Plaça de l'Armada, you’ll find the entrance to the cactus garden. This entrance involves stairs. If you need a stroller-friendly entrance, you’ll have to continue along the main road further downhill. If you prefer a slightly more scenic route you can also walk through Jardins de Joan Brossa first before heading to Plaça de l'Armada. There are a number of cable cars in Barcelona and chances are you have seen the port cable car when you walked around the harbor or went to the Barcelona aquarium. Its red cabins glide effortlessly above Barcelona’s port and provide sweeping views over the harbor and the beach. Needless to say, kids tend to like a ride on a cable car; for the rest of us, it was a convenient and fun way to get from Montjuïc to Barcolenta, Barcelona's beach neighborhood. DIRECTIONS From the cactus garden head back to Plaça de l'Armada. The entrance to the cable car is right next to Restaurante Miramar. TIP The gondolas are standing room-only and the windows are fairly high up. Little kids won’t be able to see unless mom or dad picks them up. There’s a tiny wooden bench on one side, though, and if you can secure a spot right next to it you can have your little one stand on top of it without having to carry them. My son loved the view and spotting boats in the water below. 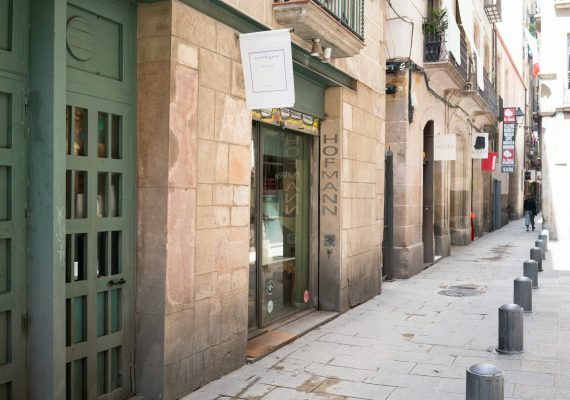 If you are looking for the best seafood restaurant in Barcelona, look no further. The food at La Cova Fumada is amazing and the lively atmosphere at this low-key, family-run restaurant is an experience in itself. It’s definitely a restaurant for the adventurous eater, both young and old. The menu is written on a chalkboard on the wall, the wait staff doesn’t speak much English and there are no high chairs or children’s menus. What they have is the freshest seafood and the most delicious tapas. Calamari, roasted artichokes, grilled sardines and scampi - you can’t go wrong with anything from the open kitchen. My son ate the first plate of calamari all by himself and requested more. TIP La Cova Fumada is very popular with locals and tourists. If you come for dinner, arrive early and check that they are actually open. Last time we arrived at 5:30 p.m. on a Friday (one of the few days they serve dinner) and there was already a 15 min wait. Thankfully, there’s a playground across the street so our son didn’t mind the wait. Who doesn’t like good ice cream? This cute little place offers homemade ice cream that parents and kids will enjoy alike. There’s no seating inside but across the street is a little playground on Plaça Poeta Bosca, with benches. DIRECTIONS Kuku Helados is right next door to La Cova Fumada.